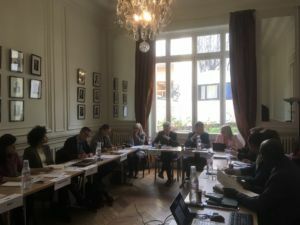 On 27 February, the Advisory Group of the Alliance met at the OIE Headquarters in Paris. The aim of the meeting was to discuss the role of the Alliance in the changing health security landscape, the strategic targets for health security capacity building, and the programme and working methods in 2018. Dr Francois Caya of OIE, Romina Stelter of WHO, and Rocio Schmunis of the World Bank presented updates on different aspects of the health security capacity building cycle, from external evaluations to the financing and implementation of national plans. Jose Fernandez, as a representative of the GHSA 2024 subgroup led by the United States presented the GHSA consultation process, as is it will be critical to align the roles and targets of the different global health security initiatives and ensure that they are mutual supportive. The Advisory Group discussed about the fundamental value add of the Alliance in supporting the achievement of practical outcomes in health security at the national and regional level. These could include contributing to thematically oriented forums such as the strategic partnership forum in Africa. The Advisory Group also discussed the strategic targets and indicators for the work of the Alliance. It was agreed that the Alliance needed to define targets and indicators in areas where it could make specific contributions as the Alliance, whilst it is also helpful to have targets and indicators that help track the global progress (such as the number of external evaluations or national plans). The draft targets will be revised based on the discussion and shared for comments. There was a consensus that “JEE Alliance” is now a somewhat misleading title, and too narrow to represent the comprehensive approach of the Alliance. Co-chair rotational arrangements were also briefly discussed.